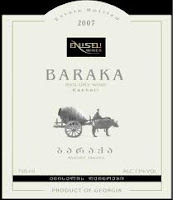 Baraka means abundance in Georgian. The wine is made from the Saperavi grapes hand-picked in the village of Eniseli, Kakehti region of Georgia. Aromas were a little funky at first. I got lots of prune with small hints of chocolate. After a short time there appeared some blackberry and elderberry with hints of currant and some black cherry. In the mouth, the wine was very dry. Some fruit, nice acidity, but a bit bitter or tart with robust tannins. Finish was short to medium and very dry with some dark fruit. Should have kept this one for a few years, but I have a difficult time doing that. The wine paired OK with the chicken and was excellent with dark chocolate wafers later that night. The price is amazingly low at $12 and the wine should age nicely and that is why I will Highly Recommend.